Compass Knowledge Holdings, Inc Merger With Embanet Corporation - Berkery, Noyes & Co., LLC. New York, October 26, 2010 — Berkery Noyes, a leading independent investment bank serving the education, information and technology markets, announces that it represented Compass Knowledge Holdings, Inc. of Orlando, FL, in its merger with Embanet Corporation. 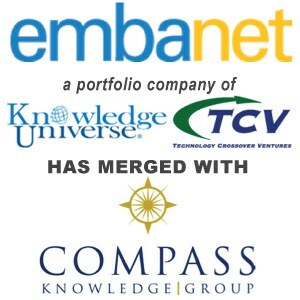 Effective today, the new entity is operating under the name Embanet-Compass Knowledge Group. Since 1993, Compass has partnered with top-tier, not-for-profit academic institutions to help them plan, implement and operate successful online academic programs. Compass provides the entire complement of online learning support services – including market research, program marketing, student recruitment, instructional design and technology, student retention support, faculty training and support, technical helpdesk, and online bookstores – enabling their partners to concentrate on delivering high-quality academics. Founded in 1995, Embanet is a global leader in providing a full range of online learning services to postsecondary educational institutions. Embanet preserves academic integrity and maximizes student enrollment and graduation by providing capital and expertise in program development, marketing and enrollment, student services and technology support. Financial terms of the transaction were not disclosed. Embanet-Compass Knowledge Group brings together two of the leading organizations serving the not-for-profit online higher education market. Embanet and Compass share a common mission and service model to help colleges and universities ensure quality outcomes for students and expand their reach through online degree programs, both nationally and internationally. The combined strengths of these two organizations will create the stability and agility required to meet the growing global demand for online learning. The mission of Embanet-Compass is to assist traditional institutions in launching and managing large, successful online degree and certificate programs in a highly competitive environment. “Under the leadership of Daniel J. Devine, the Company’s Chairman and CEO prior to the merger and Vice Chairman of the Board of Directors for the combined business going forward, Compass became the pre-eminent leader in providing end-to-end distance learning services and solutions to colleges and universities that address a highly attractive area of higher-education: online learning. As a pioneer in this space, Compass understands the many challenges universities face in launching and maintaining online learning programs. The Company has refined its approach and methodology to deliver consistent, predictable and successful results to its academic partners,” said Vivek C. Kamath, Managing Director of the Education Practice at Berkery Noyes. “Compass and Embanet have a highly talented professional team led by current and future CEO Steve Fireng. I fully expect that they will continue to maintain their market position as the leading higher education service provider to colleges and universities. The combination of these highly respected organizations will enhance the service offerings colleges and universities currently receive and will benefit students in ensuring they receive academically superior online programs,” said Christopher L. Curran, Special Advisor to the Education Practice at Berkery Noyes. About Compass Knowledge Group: Since 1993, Compass (www.compassknowledge.com) has been the pioneer and premier provider of distance learning services to prominent non-profit higher education institutions, helping them plan, implement, and operate successful online undergraduate and graduate degree programs. Compass provides the entire complement of online learning support services—including market research, program marketing, student recruitment, instructional design and technology, student retention support, faculty training and support, technical helpdesk, and online bookstore—enabling their partners to concentrate on delivering high-quality academics. Compass Knowledge Group’s success is based on a history of predictable performance that far exceeds industry standards. Compass services many colleges and universities including University of Cincinnati, Boston University, Ohio University, University of Florida, University of New England, Eastern Kentucky University, and Florida Hospital College of Health Sciences. About Embanet: Founded in 1995, Embanet (www.embanet.com) is the world leader in providing a full range of online learning services to postsecondary educational institutions. Embanet preserves academic integrity and maximizes student enrollment and graduation by providing capital and expertise in program development, marketing and enrollment, student services and technology support. Embanet serves over 50 colleges and universities, including many top research institutions, such as Vanderbilt University, University of Southern California, Boston University, George Washington University, Northeastern University, Ohio University, and Kent State University.